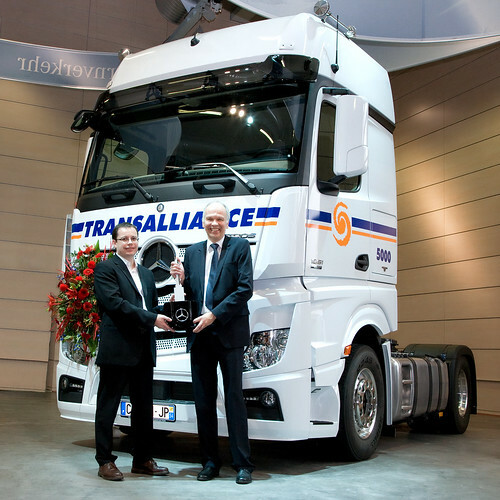 The 1st new shape Euro VI Mercedes Benz Actros has been delivered to Transalliance in France. The truck was handed over as the 1st in an order of 500 trucks, to be delivered over the next few months. Transalliance is one of the largest logistics companies in Europe. Its fleet comprises 3200 vehicles, including 700 trucks from Mercedes-Benz. This comes from the press release: The new Mercedes-Benz Actros is the first truck to be designed specifically for the Euro VI standard, which will become mandatory in 2014. Its pollutant emissions have been reduced to a barely detectable range. The new Actros model also sets benchmarks in terms of fuel consumption: in comparison to the established Actros, the new Actros designed to Euro VI standard results in a further 3-4 percent reduction in fuel consumption. Transalliance truck LXN-704, registered in Hungary, was involved in an accident on May 2nd, 10am, at J3 of the M25 in the UK, on the roundabout intersecting with the M20. He was stationery at lights in the middle lane, and when the lights changed he forgot to check his blind spot and pulled over into the inside lane, causing serious damage to a Toyota Prius. The driver looked as if he’d been driving all night. Safer trucks are good news, but all foreign LHD lorries driving in the UK need to be equipped with an additional mirror to facilitate checking their blind spot. Safe trucks are also entirely dependent on good, well-rested drivers.